Apple's voice-controlled personal assistant Siri becomes even more powerful with iOS 8, including an entirely hands-free mode that allows users to ask questions and accomplish tasks by simply first saying the words "Hey, Siri." After installing iOS 8, users can enable Siri's new handsfree mode by opening their iPhone or iPad's Settings application, choosing General, and then Siri. From there, simply ensure that the switch for "Allow 'Hey Siri'" is turned on. "You can speak to Siri without pressing the home button by saying 'Hey Siri' when connected to power," iOS 8 notifies users. "Hey, Siri" works in any situation as long as the iPhone or iPad is plugged in, even if the screen is locked or if an application is open and running. 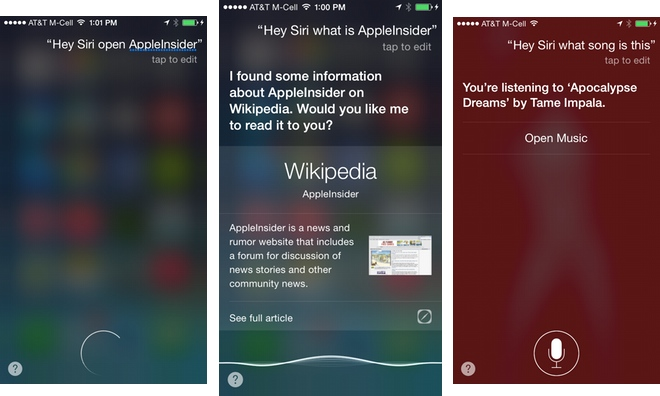 Users can simply speak naturally, and do not need to pause after saying "Hey, Siri." In addition to the new handsfree mode, will Siri also tap into the HomeKit features Apple has baked into iOS 8. As new applications and third-party accessories hit the market, users will be able to use Siri to accomplish tasks like adjusting the temperature in their home, closing the garage door, or even locking the front door. Early betas of iOS 8 would respond to smart home commands. 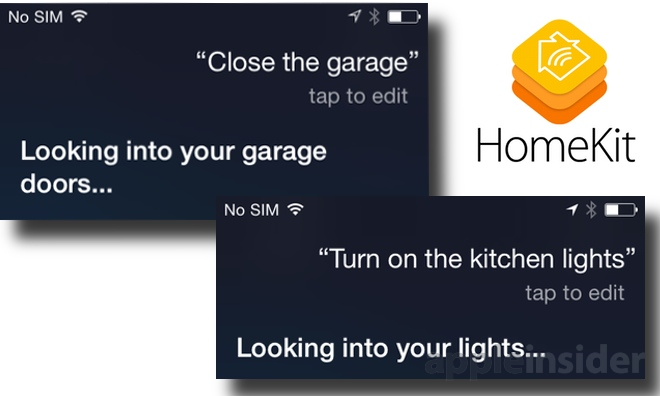 In earlier developer beta releases of Siri, the system would respond to commands such as "close the garage" or "turn on the kitchen lights. As of the golden master of iOS 8, however, the voice-driven assistant simply conducts a Web search, suggesting that HomeKit features may not be active until a user installs appropriate third-party applications. Apple is also expected to update Siri in iOS 8 to use Shazam to identify a song that is currently audible. Currently, however, Siri will simply tell the user what song file is playing on the iPhone or iPad itself.